landLAB collaborated with OBR Architects on the San Diego Foodbank’s refresh of their existing wharehouse building. The goal of the project was to provide an opportunity for Donor Recognition, create useable outdoor areas for staff, provide learning opportunities with a demonstration urban veggie garden and composting area revitalizing and activating un-programmed and unused spaces. A The project incorporates on site stormwater, and low water use plantings. 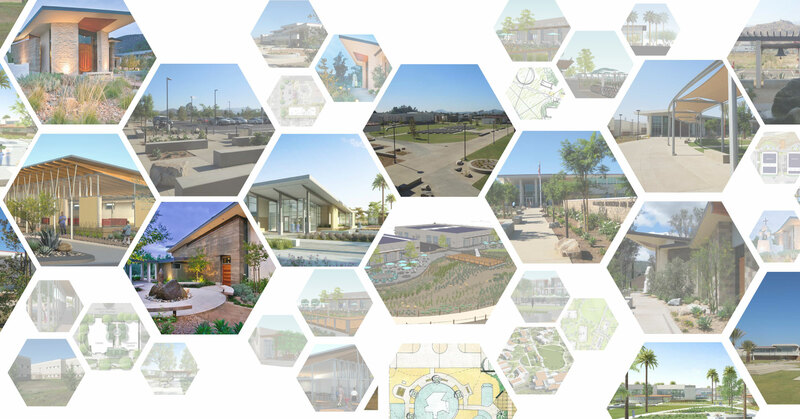 landLAB collaborated with Safdie Rabines Architects on a new Community Center and Library for the Lincoln Acres community in southeast San Diego. landLAB collaborated with Architects Roseling Nakamura Terada on the Scripps Institution of Oceanography Research Support Facilities at University of California San Diego aka ‘Seaweed Canyon’ an existing, functioning research, staging and storage facility tucked away in a deep canyon on the UCSD campus. The entry reconstruction project at Birch Aquarium is a collaboration between the University of California at San Diego and Scripps Institution of Oceanography at Birch Aquarium. landLAB collaborated with Kevin deFreitas Architects on Saint Bartholomew’s Chapel to replace the historic chapel that tragically burned to the ground in the 2007 Poomahca & Witch Fire’s.